WILLEMSTAD - The Chinese State Company Guangdong Zhenrong Energy (GZE) wants to stop air pollution on the island. “We see and smell the pollution,” said the representative of the company Bingyan Chen during his presentation in Parliament this week. There must be a safe production. Instead of using residual fuel, LNG (the cleaner liquefied natural gas) will be used. This alone leads to a cleaner production. In the oil refinery area itself, GZE wants to replace everything, all pipes and chimneys and fix the infrastructure. Guangdong Zhenrong Energy itself is also in favor of a new refinery, although this will mean at least 6.5 billion dollars, while only Isla's modernization costs about 3.4 billion. First, the current refinery which has emerged right in the middle of the city years ago presents risks and dangerous situations for the population. Secondly, a whole new plant offers more flexibility in terms of production targeting the international market, taking into account the long-term question whether oil and fuel products will still have a future. “Therefore, reallocation is better,” said Bingyan Chen's interpreter, who pointed out that in the end, the Chinese Central Government's permission is still needed for the necessary funds. 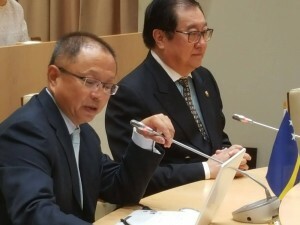 The pollution must stop, said Chen in his opening statement in the Parliament.